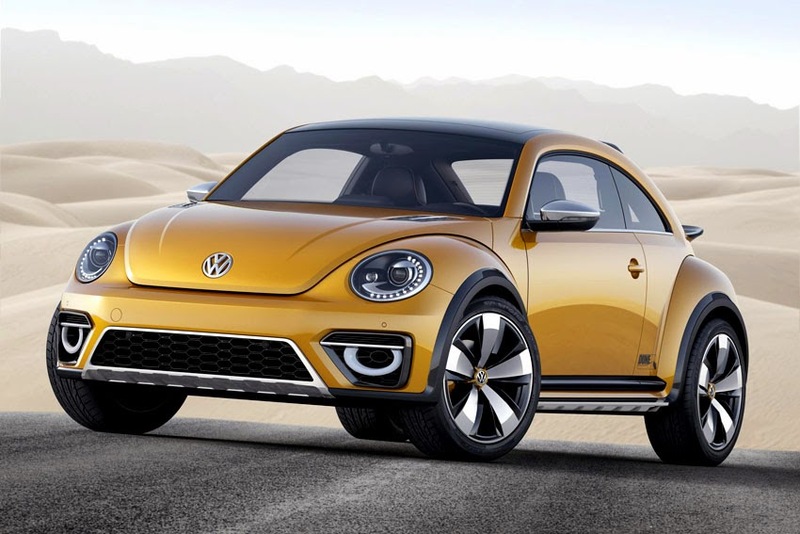 The new Volkswagen Beetle Dune concept has made its debut at the North American International Auto Show (NAIAS) in Detroit. raised by 50 mm compared with a standard Beetle, and 19-inch wheels with large tyres. A rear-mounted ski-rack is reminiscent of those fitted to classic Beetles, and makes a perfect accessory for the season. In the summer, it could hold sand skis - the ideal accessory for surfing the sand dunes from which the Beetle Dune takes its name. The Beetle Dune concept revisits an idea from January 2000, when Volkswagen showed the New Beetle Dune concept in Los Angeles. But while that vehicle was far from a production possibility, the Beetle Dune is very much based on the current production model, using the same 210 ps turbocharged petrol engine and six-speed DSG gearbox, providing power to the front wheels. Under its shining 'Arizona' paint - a yellow-orange metallic - the Dune has two-part wheelarch extensions. A 'blade' of 1.5 mm-wide plastic separates the main matt black wheelarch extensions from the body. The matt wheel-arch housings widen the body by 24 mm each side, for a total width of 1,856 mm, while the front and rear cladding lengthens the car overall by 12 mm to 4,290 mm. At 1,536 mm tall, the Dune is 50 mm higher than a standard Beetle. To fit with the increased body width, the Beetle Dune's track has also been increased by 29 mm, to 1,607 mm at the front and 1,573 mm at the rear. The five-spoke 19-inch alloy wheels wear 255/45 tyres. Visually, the front and rear wheel-arch extensions are joined by a brushed aluminium sill panel that runs between them, into which a chrome-plated underbody protection panel sits. At the front, the bumper has been comprehensively redesigned to incorporate a large black honeycomb air intake, with trapezoidal inserts either side. In these inserts sit semi-circular LED fog lights, and above these is a slender horizontal LED turn indicator. The Dune's bonnet, meanwhile, has been made more bulbous, with a raised central section and prominent air vents on either side. At the rear, above the modified bumper, sits a large rear spoiler, which, together with another roof-mounted spoiler, serves a dual purpose as a ski rack. The interior of the car is largely familiar from the production Beetle, but with the characteristic dash-mounted glovebox this time replaced with a passenger grab handle. The centre of the dash is dominated by a large high-resolution 7.7-inch touchscreen display.